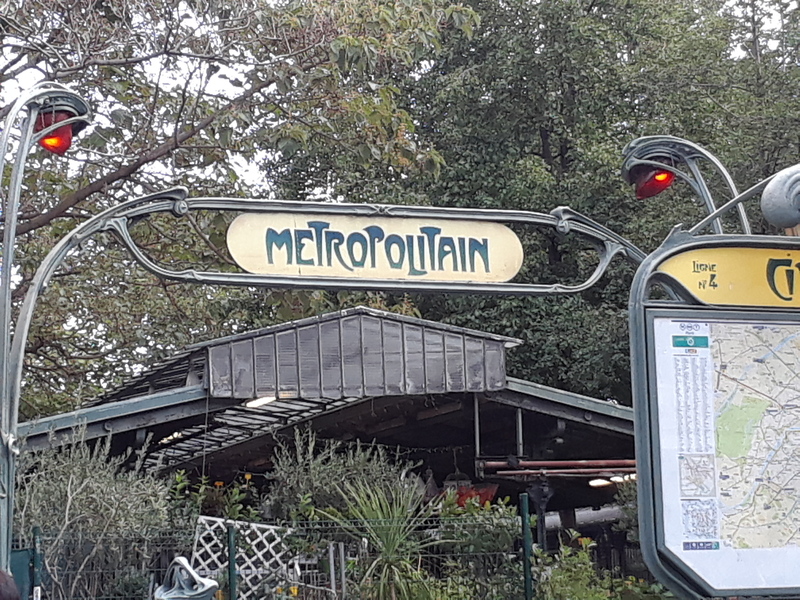 Continuing on our Monet Trail, one morning we took the metro to a more residential area in western Paris. Blue sky and warm sunshine met us as we came up the station steps. As we scuffled through leaves on the sidewalks and picked up smooth mahogany chestnuts, we enjoyed the arrival of fall. 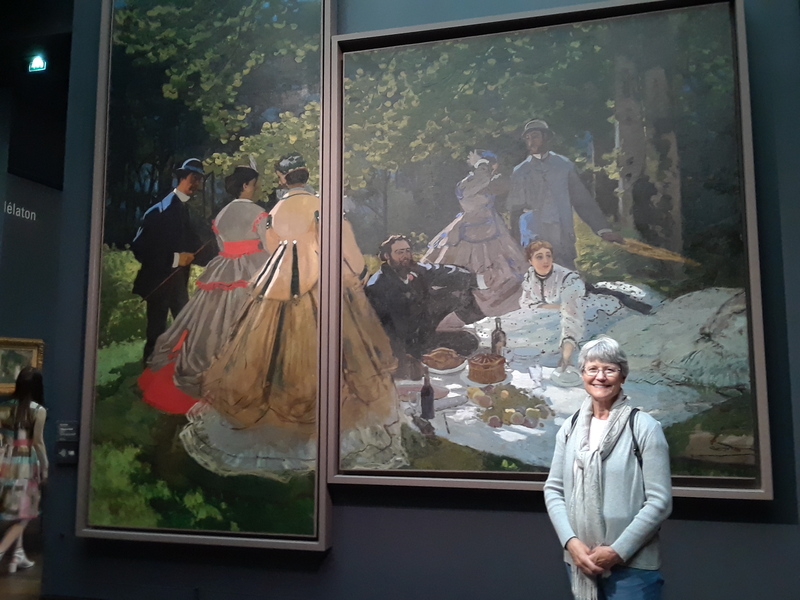 The Musee Marmottan Monet is near the Bois de Boulogne, where Degas painted his horse racing scenes, and where other Impressionists sometimes painted people picnicking or strolling beside lakes. The Bois de Boulogne was once part of a forest where French kings and nobles hunted. 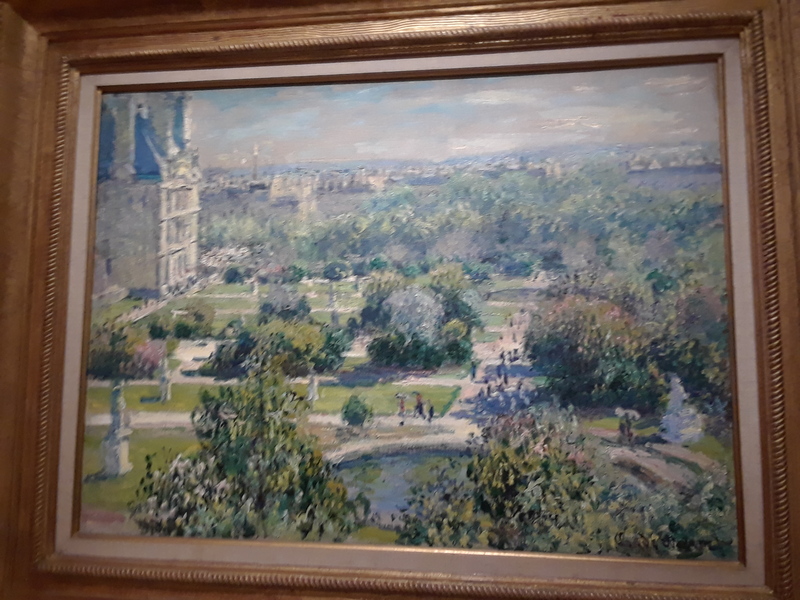 By the time of the Impressionists, it had become a fashionable park that had been part of Napoleon III and Baron Haussmann’s drastic modernization of Paris in the 1850s. This included, not only parks, but broad new boulevards and modern apartment buildings that displaced thousands of poor Parisians to the city’s outskirts. About this same time Jules Marmottan bought a former hunting lodge on the eastern side of the Bois de Boulogne, and he and his son turned it into a mansion with fine furniture and art. The son left the mansion and its art to the French Academy of Fine Arts, which opened it to the public in 1939. Musee Marmottan Monet now houses the largest collection of Monet’s paintings in the world, many coming directly from the artist’s family, because Michel Monet, the artist’s second son, left the collection he inherited from his father to the Marmottan. Other works came from the doctor who was the personal physician of many of the Impressionists. 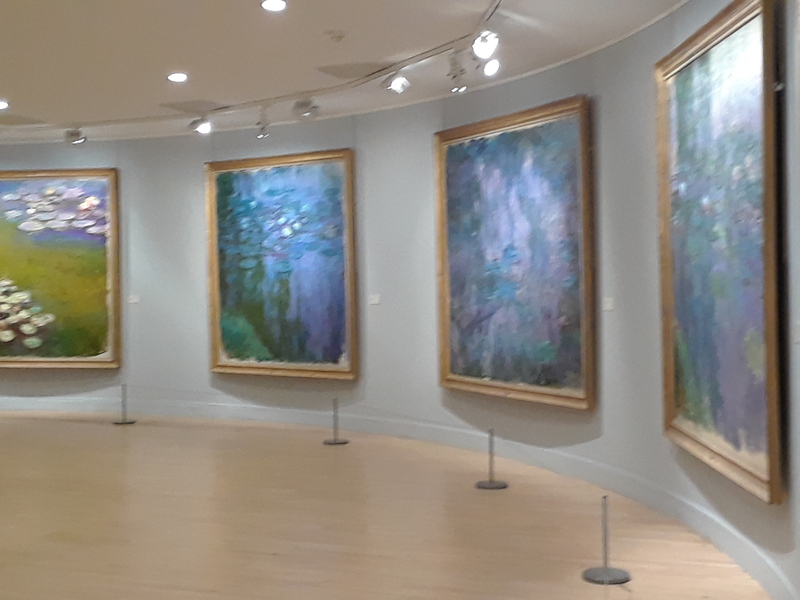 Although it doesn’t have the huge water lily canvases of Musee de L’Orangerie, it does have a number of large water lily paintings, as well works by other Impressionists. the painting by Monet that gave the movement its name. 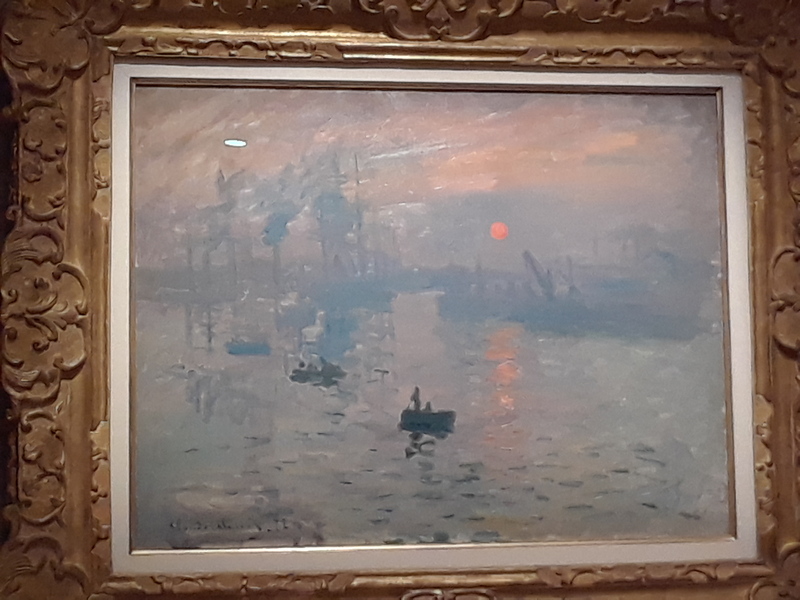 In it Monet painted a sunrise over Le Havre harbor, showing how the water and the sun’s reflections on it sparkled and changed moment by moment. Sunrise was in the Impressionist’s first exhibit in 1874, and a magazine critic made fun of the paintings, especially Monet’s. The critic titled his article, “Exhibition of the Impressionists,” and the name stuck. 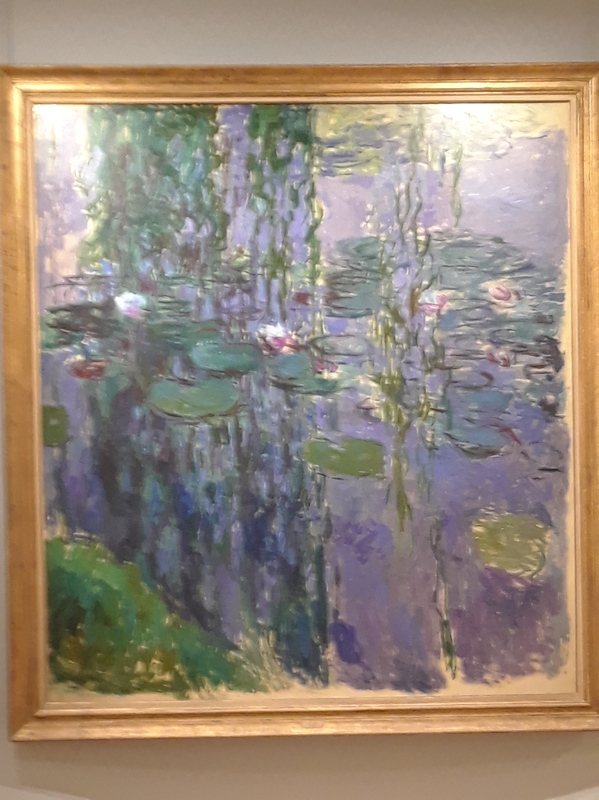 Seeing that painting at the Marmottan , and sitting surrounded by water lily paintings and wandering through the galleries to see other works was a delightful way to prepare us for our visit to Giverny, the inspiration for the water lily paintings that occupied Monet for the last 20 years of his life. Monet and Pisarro both favored landscapes, but when Monet included people, they were middle class people enjoying a walk or time in a garden. Pissarro painted country scenes, which often showed peasants at work in gardens and fields. Renoir and Degas preferred to paint people, but Renoir liked to paint happy people dancing or dining at cafes. His women and children are dressed in their best. Degas painted a more work-a-day world of laundresses and poorer girls, who became ballerinas to earn a living. Morisot and Cassatt made moving and beautiful paintings of family members, especially of mothers and children. They may have wished to branch out more, (Cassatt once did paintings of bull fighters), but middle class women led a fairly restricted life at this time. They couldn’t roam Paris or the countryside on their own, as did the men. Look at some of Monet’s paintings that include water, one of his favorite subjects. It’s fun to see how he painted reflections in short dashes of color. Molly enjoyed the cooler autumn weather, too. Next up, the train trip to Giverny, going through Gare St. Lazare, the same train station that the Impressionists often used, and that Monet painted a number of times. Sign up to receive the next Kathythepicturelady post and read about the Impressionists’ love of trains. 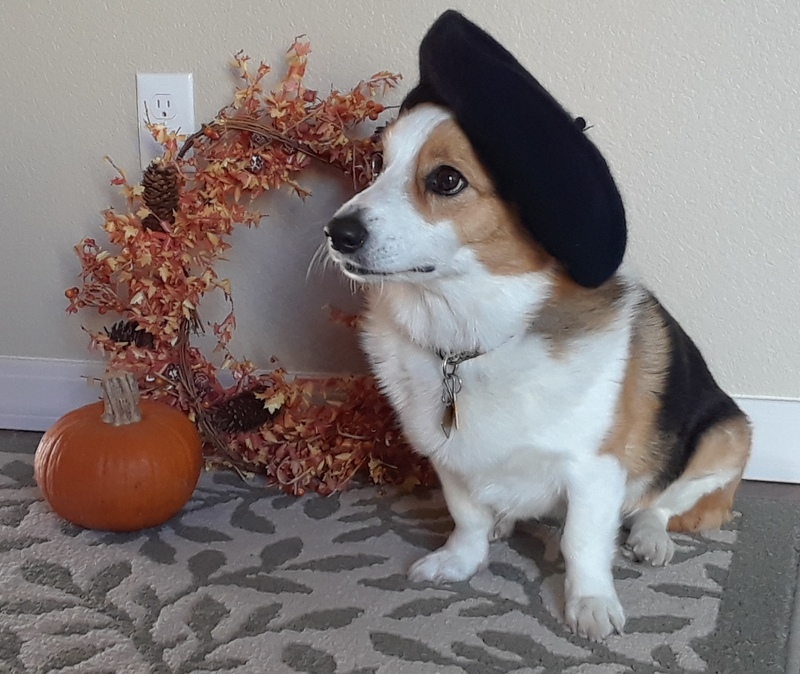 All photos in this post were taken by the author. 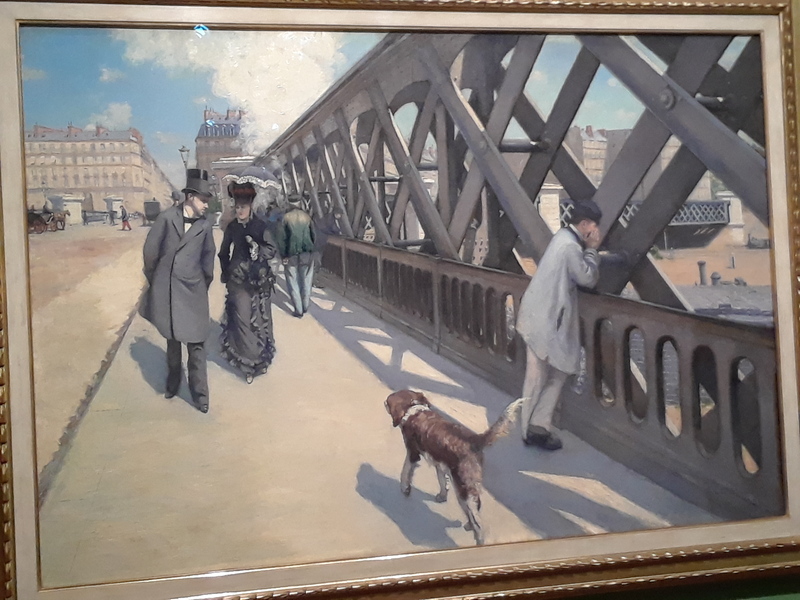 This entry was posted in Uncategorized and tagged Auguste Renoir, Baron Haussman, Berthe Morisot, Bois de Boulogne, Camille Pissarro, Claude Monet, Edgar Degas, Gustave Caillebotte, Impression Sunrise, Mary Cassatt, Michel Monet, Musee Marmottan Monet, Paris on February 9, 2019 by Kathy The Picture Lady.